Scraping paint might not be the most boring thing ever, but it's in the running. I had great intentions of blogging about my big refit, but while I was in the middle of it, I just couldn't muster up the moral fortitude. But now that the Blue Moon's winter cover is on, and I can't do any more scraping, sanding, or painting on her, I'm suddenly in the mood to write again. Why so boring? Probably because something in my nervous system compels me to do thing the hard way. My father was famous for this characteristic, and I've often expressed relief that I didn't inherit this trait, but I'm starting to wonder. 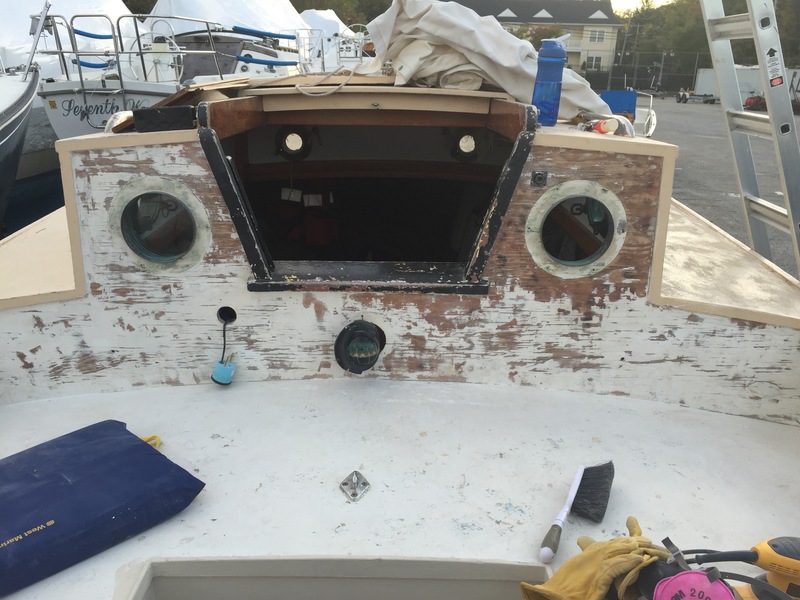 It all started with a Louis Sauzedde video showing how easy it is to strip paint off your boat with a heat gun. Louis made it look so easy that I decided to 'do it right' when it came to scraping my old paint off. So I went out and bought the most powerful heat gun I could find, and gave it a whirl. The heat gun does work, but it didn't take long to figure out that my gun wasn't quite the same caliber as Louis's. In fact, a little research uncovered the fact that Louis's heat gun runs in the $600 range. Ideal for a pro, but not for me. The main difference in the two guns? Speed. Or lack of it. 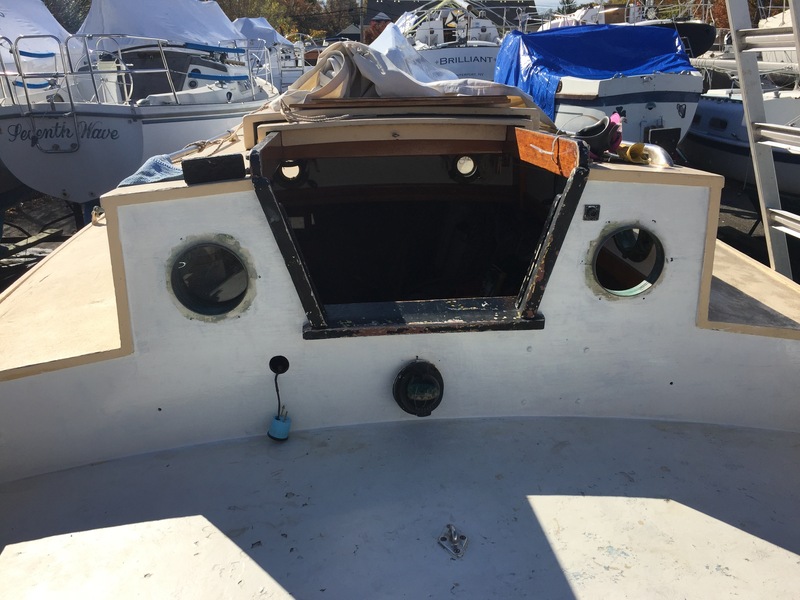 It took a couple hours to take off the worst on this one small part of the boat. You can see I stopped aiming for bare paint after finishing around the starboard portlight. Anyway, I kept at it and got a good primer coat on for the winter, but its obvious that I've got a very big job ahead of me. In the spring. With primer... nice and smooth, anyway! 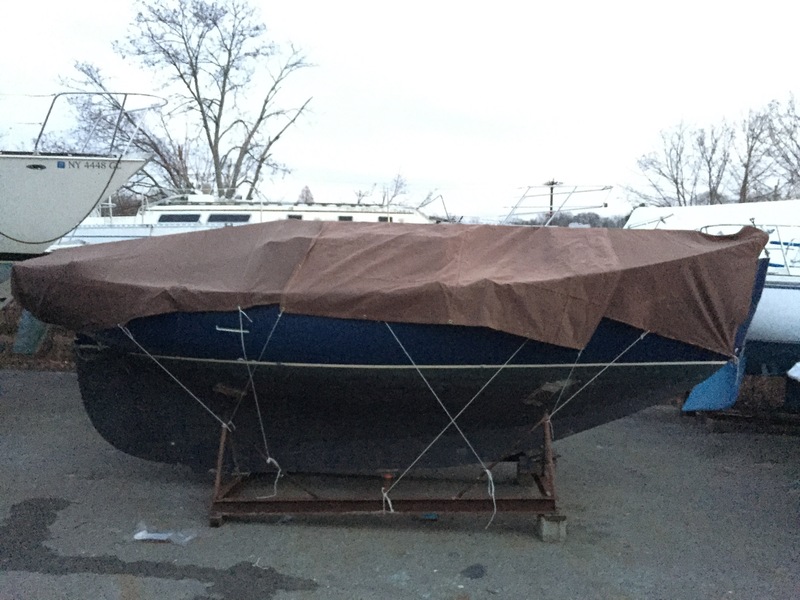 One thing I did want to do was to get a good winter cover on before the snow started flying, to minimize the wear and tear on the deck over the winter. 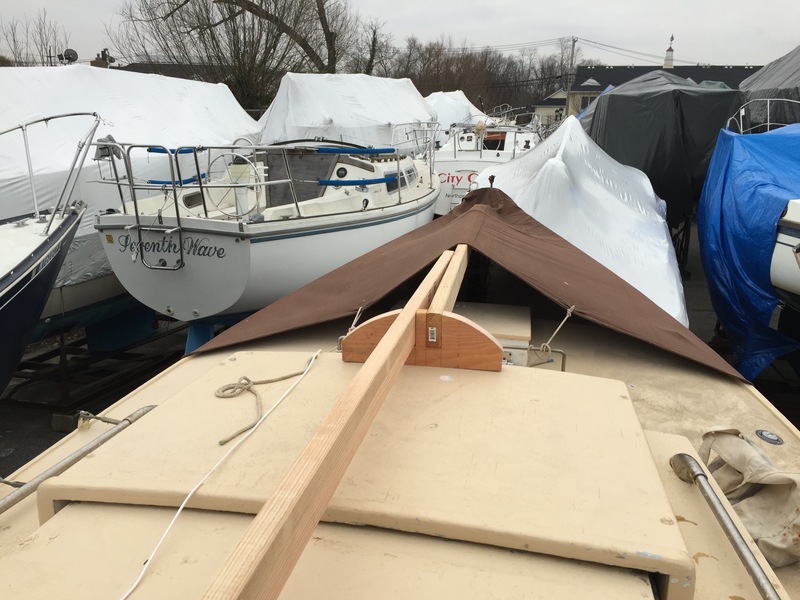 I already had a couple of good heavy canvas tarps, but with the mast out of the boat, and no boom to sling the tarp over, what would I do for a ridge pole? I've tried the PVC route in the past, but the canvas covers are just too heavy for such flimsy stuff. After a bit of thinking I decided to use simple 2x4s, supported by a pair of home made crutches. I've never seen anything like this before, but they were easy to make. One crutch supporting a 2x4 over the cockpit, and another over the deckhouse. And another crutch on the forward end of the deckhouse. 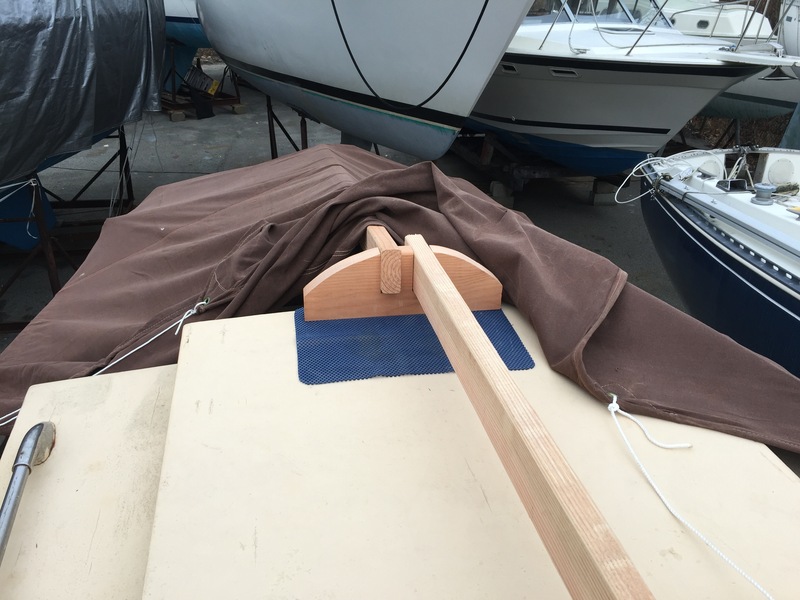 The crutches keep the 2x4 ridge poles in order, and also are high enough to keep the tarp off the top of the deckhouse. I'm not sure the ridge pole is high enough to shed snow on it's own. I may have to help with a broom. I also suspect the canvas will stretch a bit -- particularly with some snow on it -- but I can easily take up the slack from the ground. It's certainly better than nothing and if the low crutches don't work, I can always make different ones next year. 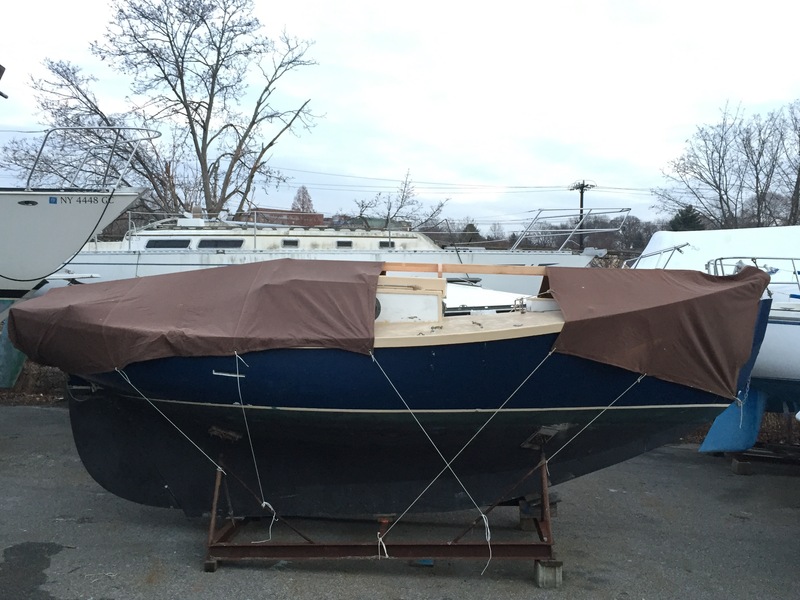 In the world of plastic boats, I had to answer the question: why heavy brown canvas? Why not the ubiquitous and cheaper blue poly? I originally got the canvas tarps because I wanted something that would breath, but now I just like them. I've used them two seasons now and they are showing no sign of wear at all. The middle one is new, and it is a bit lighter color, but the others look and feel brand new. And they are so heavy they don't flog all winter. Oh, and I just think they look better. Is looking better a good reason? I think so. You could put in some 2x4s out at right angles from the ridge pole so that you have a kind of roof effect - covered in taut canvas this would solve the snow shedding problem - but I am sure you have thought of that. A few years ago when undergoing an extensive (a couple of years long) refit I made a large roof arrangement as I have described that I could move around under and sit upright on the cabin top - this meant I could work all winter (but of course our winters here aren't as cold as yours) - just a thought. Was missing my dose of "The Unlikely Boat Builder". Thanks for the post.